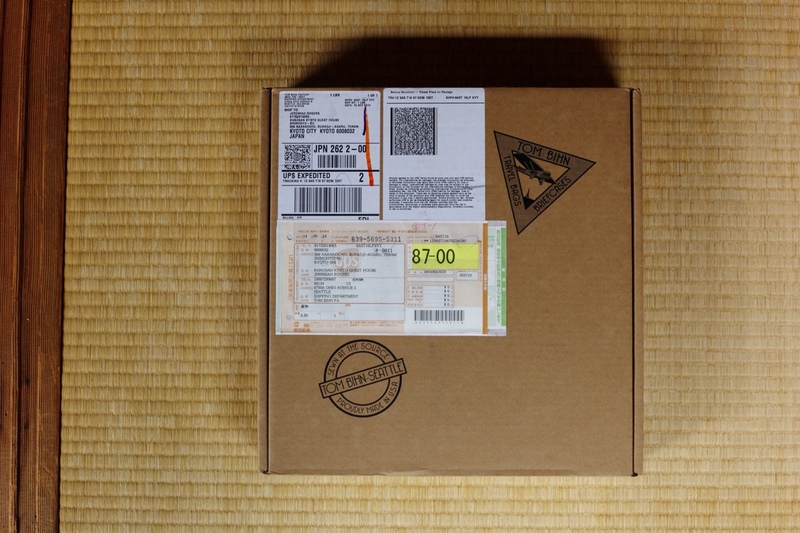 Two months ago I asked Tom Bihn if they could send me one of their new Daylight backpacks to review in Japan. They graciously mailed a bag across the ocean to Kyoto and I’ve been using it full time since then. 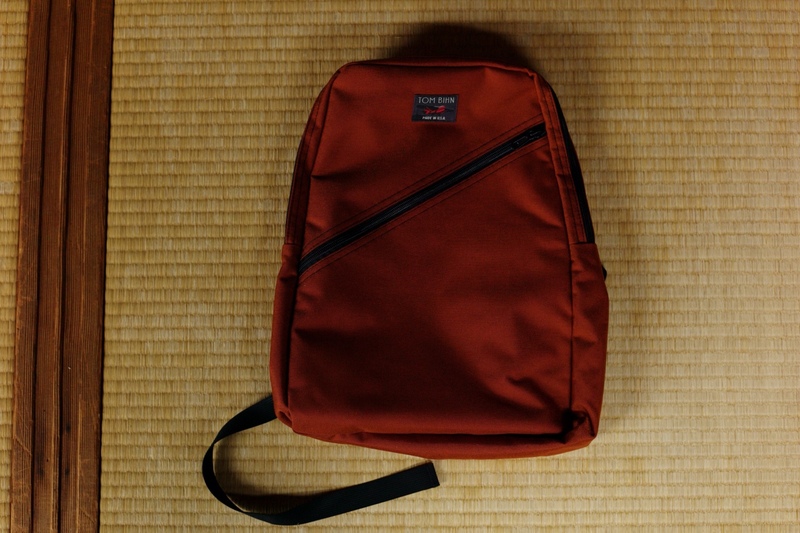 The burnt orange Daylight pack as it arrived in Kyoto on the tatami mat floor of my hostel. 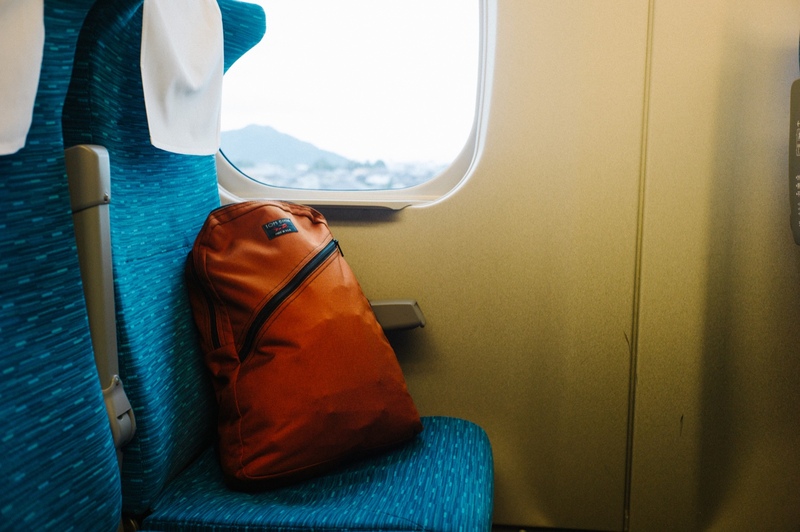 I’ve used enough backpacks while traveling to know that faults often take a few weeks or months to show themselves1. Having used the the Daylight as my main bag for two months I’m confident that I have found its flaws and can review it properly. To me this is a brilliant bag. My favorite product designs are the very basic and inexpensive things that get a job done in style. I love Apple’s AA battery charger and Muji’s cutlery for these reasons and the Daylight is similar. It is exactly what a daypack should be and nothing else. I’m something of an accidental bag reviewer. I just want gear to get the job done and get out of my way, but in the process of finding a bag to do a job well I’ve learned things. Mostly it’s about a thin line between a cheap and heavy pack and a pack that cuts too many corners to be practical. All of Tom Bihn’s bags straddle this line well. Take the Synapse 19: It’s 680 grams but compares favorably in organization, durability, and water resistance to packs above 1 kilo that I’ve seen from Kelty and Deuter. On the other end I’ve tried to cut weight even more by using minimal packs from Boreas and Mont Blanc but then found that the bags were not durable or water resistant enough for my needs. Tom Bihn strikes a good balance. The Daylight is 44% lighter than the Synapse 19. Obviously it needed to cut features to save weight. These cuts and compromises were done incredibly well. Weight savings came from removing padding on the straps and back of the bag and by limiting internal organization. 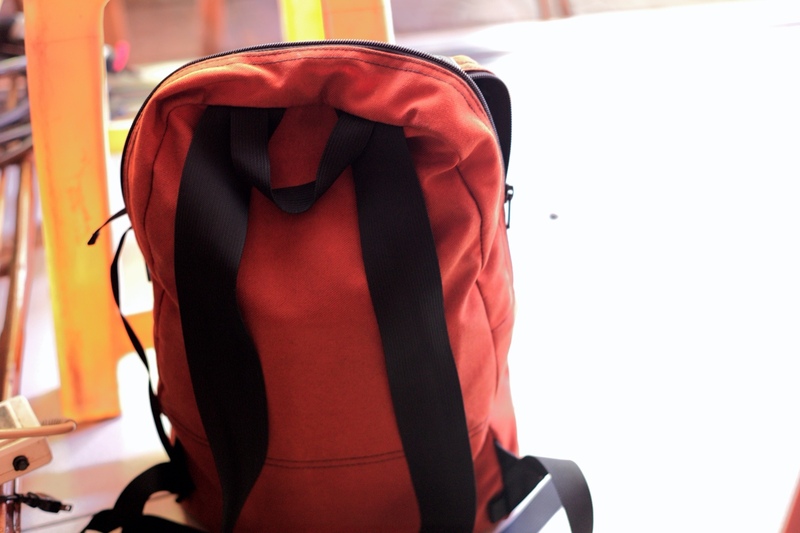 The durability and water resistance of the bag remains good enough for everyday use. What’s good: The Cordura keeps my gear dry even in moderately heavy rainstorms. The cordura is substantial enough to deal with heavy abuse on the road. The thin straps are comfortable for my regular load of 5-15 pounds and don’t make me sweat as much as other straps. The vertical layout of the pack gives it a slim profile. The slim profile makes a heavy pack feel lighter and makes walking in crowded areas easier. The bag is so thin that when it gets dirty I can just wash it in the sink with soap and air dry it overnight. The Daylight’s thin straps and internal holding pocket (with an iPad in it). 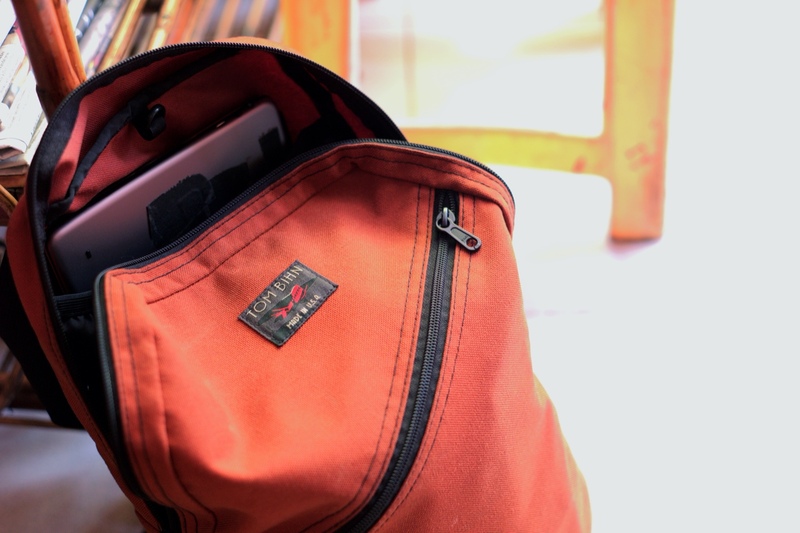 The burnt orange is a hard color to capture accurately, so see Tom Bihn’s website for the right colors. Compared to their other bags, Tom Bihn removed the padding from the straps and the back of the Daylight. This may bother you, but in practice I have found that I like it more. The pack is lighter, easier to wash, and faster to dry. My gear is around 10 pounds now and with that minimal weight I don’t mind the lack of padding. The Daylight feels slightly less water resistant in practice than the Synapse 19 or the Smart Alec, but it holds up fine in light and medium rain. For heavy rain bad enough to flood streets I prefer wrapping my stuff in trash bags anyway. The Daylight does nothing to promote air flow across my back. I sweat all over it in the Cambodia heat and my gear can get moist. This could be improved with a liner or suspension system but both would add weight to the pack. In practice the straps are flexible enough that I can use the Daylight as a shoulder bag when days get really hot. The back pocket is hard to use if the pack is full. A bit of extra cloth on the back pocket might make make it easier to access when the bag is full. The Daylight has limited internal organization. You will want some stuff sacks to keep things separated inside the bag. I use the outside pocket for things I’ll want to grab during the day (sunglasses, pocket money, lens filters) and the inside sleeves for holding my iPad and paper books vertical against my body. I wrote an an article a while back called How Low Can You Go where I encouraged future travelers not to cover every base and to just get the minimum possible gear for their trip. That thinking infected my own travel philosophy and since then I’ve been cutting things that I don’t use from my bag. Today everything fits comfortably in the 16.5 liter Daylight, which is insane. My current kit is: four shirts (two cotton), two pairs of underwear, ear plugs, a sleeping mask, headphones, fingernail clippers, a micro hair trimmer, a folding toothbrush, swim trunks, a rain jacket, a warm jacket, a wool hat, wool shorts, one pair of pants, no socks, a pair of Keen shoes, an LG G2 Android phone, my camera, two lenses, and an iPad Air with a Logitech keyboard dock. The only change since arriving in Cambodia is adding the two cotton shirts: they’re much more comfortable than wool in this heat. All of this fits in the Daylight pack with enough room to spare for a small bottle of water. Riding with the Daylight on a bullet train in Japan.